The radius is the larger of the two bones of the forearm, and the end of this bone closest to the wrist is called the distal radius. A distal radius fracture is another term for a broken wrist, and it is one of the most common of all injuries. Fractures of the distal radius account for between 15-20% of all fractures, but they are especially common in individuals over the age of 60. In this age group, they are the second most common type of fracture behind hip fractures. Treatment for distal radius fractures typically consists of realigning the broken bone and then putting the patient in a wrist cast. Unfortunately, more than 50% of patients continue to have problems with their wrist after this procedure, which can lead to poor long-term outcomes. After the cast is removed, patients are usually instructed to follow a course of physical therapy. This can either be accomplished with a supervised program within a physical therapy clinic or with a home-exercise program designed by a physical therapist. Although both of these types of programs are commonly used, it's not completely clear which is more effective. For this reason, a powerful study called a randomized-controlled trial (RCT) was conducted to compare a supervised physical therapy program to a home-exercise program for older adults with distal radius fractures. Patients older than 60 who had been diagnosed with a distal radius fracture were invited to participate in the study. A total of 74 individuals were accepted and randomly assigned to one of two treatment groups: the supervised physical therapy group or the home-exercise group. All patients were treated with realignment and a cast for about 6.5 weeks and began their rehabilitation afterward. The supervised physical therapy consisted of hour-long sessions 2-3 times per week for a total of 12 sessions, and each session began with 15 minutes of wrist and hand exercises performed in a 93°F whirlpool bath. After this, the therapist performed a specific set of mobilizations of the wrist joint and then instructed patients to perform three other exercises designed to improve the flexibility of their wrist. For the home-exercise program, a physical therapist taught each patient how to properly perform a set of exercises at home during a 30-minute session. Their home-exercise program lasted 20-30 minutes and was to be performed twice a day for six weeks. It consisted of various stretching exercises and got progressively more difficult as time went on. All patients were evaluated before treatment began, immediately afterward and then after six months for wrist pain and function, as well as several other outcomes. Results showed that overall, patients in both groups improved in all of the measurements taken. 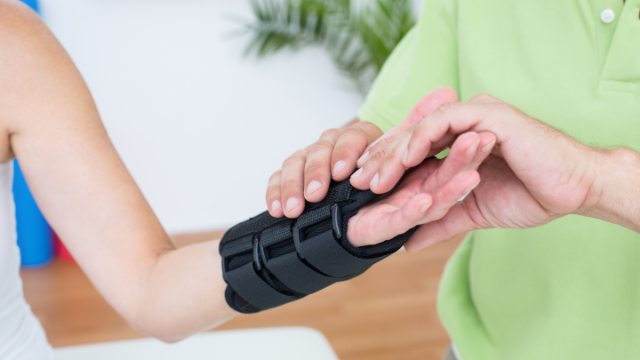 However, the participants who followed supervised physical therapy experienced significantly greater improvements in wrist function, as well as less pain and better wrist flexibility, compared to those who followed a home-exercise program. This was found to be the case immediately after treatment, as well as six months later. These findings suggest that a supervised physical therapy program will lead to better outcomes for individuals older than 60 with a distal radius fracture, but more research is needed to confirm this. In the meantime, patients who experience this injury should seek out the services of a physical therapist for appropriate treatment, since both forms of physical therapy were found to be beneficial for all patients in this study.